An Aberdeen hotel has secured a local Doric accent for its lift - to make guests feel more welcome. 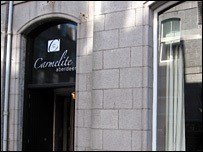 Management at the Carmelite in the harbour area were keen to get away from the previous recorded English voice announcing floors. They launched a competition to find the most appealing Doric accent. Aberdeen window cleaning business owner Steve Taylor, 37, beat dozens of rivals to win, and said: "I am stunned but it's quite flattering." The hotel set up a dedicated phone line for contestants to leave messages so they could be judged. Management spent the next few weeks gathering entries before deciding on a final three, who took part in a deciding test at the hotel on Friday. Mr Taylor, BT manager Kim Lyon, 47, and engineer Iain Morrison, 34, were judged reading a Doric poem as well as lift phrases "Welcome to Carmelite", "Doors opening" and "Lift going up". After a nervous wait, Mr Taylor was picked as the winner and told the BBC Scotland news website: "I am very surprised, I only entered for a bit of fun. "Now we will have my local voice in a local lift. "It's good to speak with a local accent but also to be clear so people can understand it. "Now the only way is up - and that's the direction the lift goes." Mr Taylor won a night for two in the hotel, with dinner and champagne, with the two losing finalists winning champagne dinners as an unexpected bonus for their efforts. The hotel's operation director David Trotter was joined by language expert Derrick McClure to pick the winner. Mr McClure said: "I think he had a good distinctive north east accent that was very clear." Mr Trotter said: "We just found the voice we liked the best. 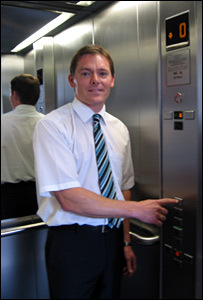 "The lift came with a very traditional English-sounding pre-recorded lift voice. It really did seem a bit out of place and the idea was just to inject a bit of fun. "A Doric accent seemed better than a generic Scottish accent." The hotel, in Stirling Street, recently opened its doors after a £2.5m refurbishment.